Need a New Pair of Contact Lenses in Greenspoint, North Houston? Greenspoint TSO offers a wide selection of contact lenses including disposable soft contact, bifocal/multifocal, toric, and colored lenses. Whether you wear daily, weekly or monthly disposables, or conventional (vial) lenses, check out our selection of lenses that fit your needs. Below are rebates available with the purchase of exam & contacts. 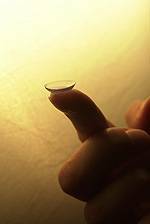 Disposable contact lenses are extremely popular. Colored contact lenses allow you to change your eye color.